84% approval rating on Rotten Tomatoes, based on 106 reviews. Critical reception summarized at Wiki. Worth noting, Ebert gave it 2.5 out of 4 stars. Only a half star less what he gave In the Mood for Love, though he was enraptured by the first film, but found the second only so-so. In the Mood for Love at FanFare. I got this through Netflix and watched the movie for the first time this morning. I had intended to pick it up for a long time, but up until now, it just never happened. Visuals, yeah. As Chow was not ensconed in his Shanghaiese enclave, the women of this movie wore more than one fashion. The camera work with the close ups all the time was different. It's like Chow, having lost Su 1.0, moved down from the colorful if cramped environs of Mr. Koo's and Mrs. Suen's apartments to the dark, drab and not so nice Oriental Hotel. The Future was interesting place. 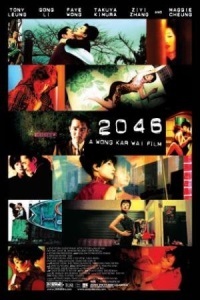 Whatever 2046 was supposed to be, I don't think I want to go there though. The train ride reminded me of Spirited Away. Maybe I got mixed up in the chronology of the movie, but how did Lulu die before Chow moved in to Room 2047, but then she is back later in the movie? The Chow character over all in the movie came across to me as "cad." It's like all that unresolved sexual tension he had built up with Su 1.0 had to come out and boy did it! The parallel shots of Chow and his lady companion in the taxi were cool, him resting his head on Bai's shoulder first and then later doing the same with Su 1.0 in a flashback. I enjoyed the callback to Chungking Express where He Qiwu takes the woman in a blond wig to a place where she can sleep and then takes off her shoes. Have to give this movie more of a think. This was my first Wang Kar Wai and I remember not getting it at all at the time. I should go back and rewatch In the Mood for Love and this in sequence to see if things make more sense. I actually just watched Chungking Express for the first time yesterday on the preview of the new Criterion Channel and loved it. I should create a post for that one. I did not like this. Doyle's cinematography is gorgeous as always, but I felt like Wong's typical, somewhat chilly distances from his characters, and the way he treats the women in this, it came across as a bit sexist to me. The languorous length and pacing didn't help much, either. For me, I felt like watching this "Oh, this is Wong entering 'old man director' territory now, just doing the same thing over with diminishing returns". Harsh, I know. But my expectations were high.